A new quilt for Erin and it is so her - lots of orange with a touch of blue! The pattern is called Contemporary Nine Patch and it is designed by my friend, Meredith. All the fabric came from her shop, which unfortunately closed this month. I am so going to miss her fabrics and the cute little shop in our small community. One thing about her shop and the years she was open, it built a community for us. 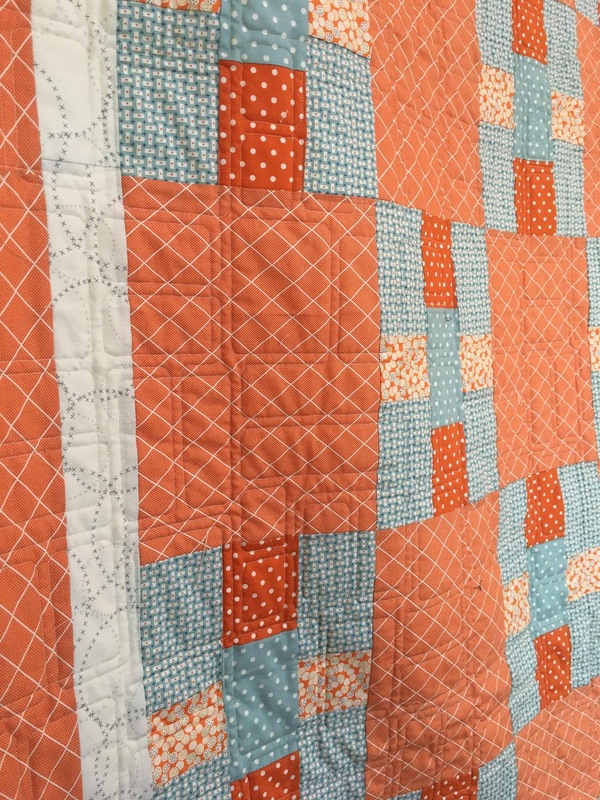 We have a quilt club which meets once a month and it is the best time. A group of women, all ages and all backgrounds and all abilities, and we are all so happy to call one another friends. After each monthly meeting, I am so inspired and the ideas just are going through my head, making it hard to sleep that night. In addition to the monthly Wednesday meeting, several of us meet at the quilt shop the other Wednesday nights and sew for several hours. I usually get there around 4 to 5 and we all stay until around 9 pm. 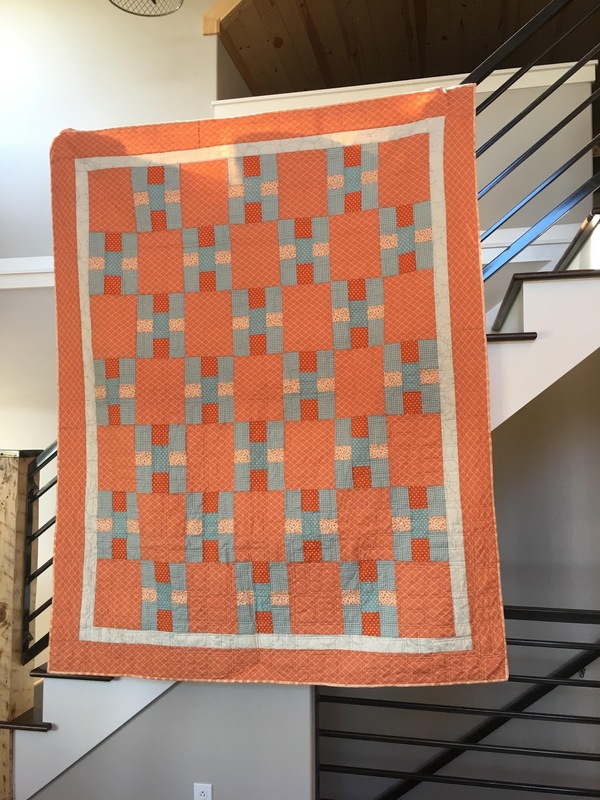 It is amazing how much you can accomplish on a quilt in that amount of time. Preparation and organization is a key part to sewing on our nights, I usually have all my pieces cut out and in ziploc bags and a small storage container is used to keep my quilt project together. Last night we had 8 of us sewing, some got there as early as noon, which can happen since the shop is closed. 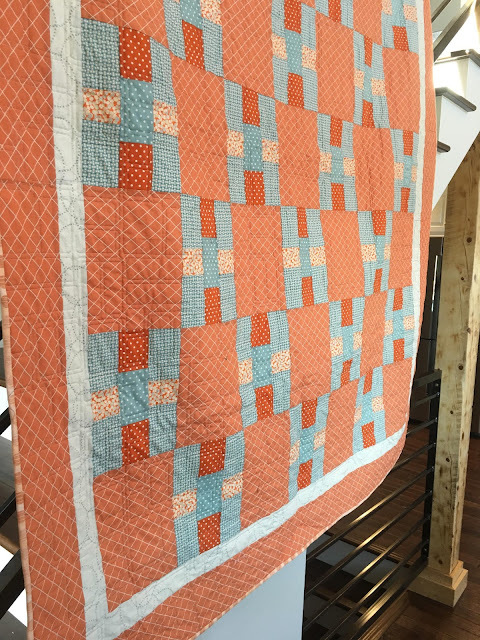 We were all working away and one friend finished two projects, (Jelly Roll Race quilts) and another finished her Contemporary Nine Patch quilt. Of course, the finished project is held up and admired by all! A few times, we all laughed so hard the tears were running down our cheeks! With all this said, I want to say if possible to find a sewing group close to you, jump at the chance and have fun with people who speak the sewing language. My friends don't sew garments, but they make beautiful quilts, bags, dolls and more and their talent is amazing. Also, they always ask if I made what I am wearing and want to know about it, which is so fun to talk about, right? I don't mean to short the online sewing community at all, it is a wonderful, giving and sharing community and so many friendships have come from the online sewing community. I just wanted to say how much I enjoy my local sewing friends and what they have brought to my life. and I will get her contact information to you. 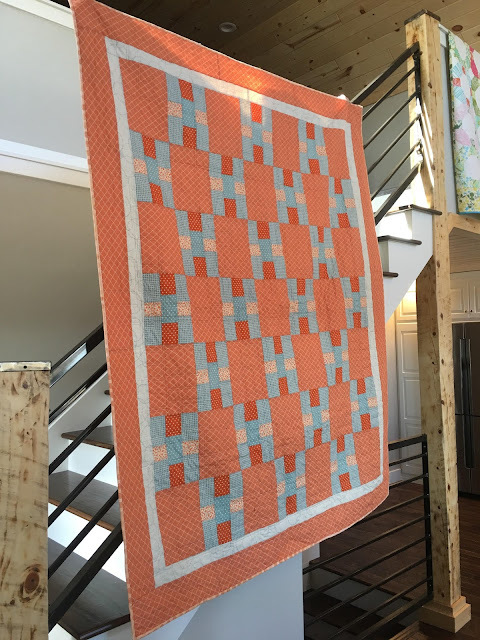 Looks like a quick and easy baby quilt. The colors are nice and bright. What a pretty quilt! I don't make quilts (yet) but I do belong to a local quilt club because the people are so wonderful & we have such a great time at the monthly meetings. I also come home from those meetings with my mind full of inspiration & find it hard to sleep on those Wednesdays! Fabric loving people are fun to hang out with in real life as well as in our great online community, I so agree. Yes, they are so fun to be with. Happy sewing. I love what you said about sewing groups. I have two friends I sew with often and we are part of a larger sewing group that formed in a former quilt shop. These people not only inspire me but enriched my life - and we are all completely different! They are so enriching to me, too. Happy sewing.